Today, Good Morning America met with our partners at the After the Impact Fund to discuss Eisenhower Center’s innovative After the Impact Program, and our Jacksonville, FL facility. Check out their interview with NFL Hall of Famer Michael Strahan below. There you can learn a little more about our work, and about the struggles military veterans, first responders, and professional athletes can experience. Also check out the article linked here, which talks with Gerald McRath, a former NFL player who discusses his experiences and struggles over the past few years. Want to learn more about Eisenhower Center’s unique programming? Or are you interested in getting involved? Use the information provided on the Contact Us page to reach us. The Michigan Veterans Affairs Association (MVAA) recognizes employers that commit to military Veteran recruitment, training and retention practices by awarding those employers Gold, Silver, and Bronze level status as Veteran-Friendly Employers. MVAA’s Veteran-Friendly Employer program helps qualified organizations recruit and retain top veteran talent while providing others a road map to improve their recruitment efforts. Eisenhower Center is proud to offer employment to the men and women who have worked hard to defend this great nation. We are humbled to be recognized by the MVAA and Governor Snyder – as a Bronze-Level Employer in the State of Michigan. Learn more about the MVAA today! If you are a veteran interested in working at the Eisenhower Center, please visit the Careers page of the website and send our Human Resources department your information. 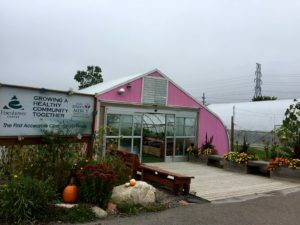 October is breast cancer awareness month, which is why each year we and our clients paint and decorate our clinical, wheelchair accessible hoop-house pink. Our innovative hoop house puts a new spin on the traditional clinical setting by taking it out of the sterile building with fluorescent lights and bringing it into a garden wonderland full of adaptive tools and unique therapy activities. Interested in engaging in our outpatient and day-treatment programs here, or at our 62 acre hobby farm? Give us a call at: (800) 554 – 5543. This morning, Tom Jones of MI-OFO was on WDIV Channel Four with the one and only Chuck Gaidica to discuss Michigan Operation Freedom Outdoors, one of many programs Eisenhower Center supports to help veterans in their rehabilitation. Click the link below to watch Tom, and to learn a little more about the program.